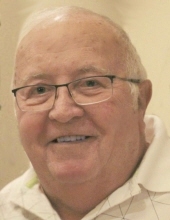 Lawrence Ervin Hanno,75 of LeMars, IA, joined Jesus in heaven on Tuesday, Nov. 27, 2018 at Good Samaritan Society in LeMars, IA. Mass of Christian Burial will be 10:30 a.m. Monday, Dec. 3, 2018 at St. Catherine’s Catholic Church in Oyens with Father William McCarthy officiating. Burial will follow in St. Catherine’s Cemetery in Oyens, IA. Graveside military honors will be conducted by American Legion Wasmer Post 241 of LeMars. Visitation with family present will be 2-5 p.m. Sunday. There will be a vigil prayer service at 3 p.m. all at Fisch Funeral Home & Monument in Remsen. Larry was born to Ervin & Regina (Bohlke) Hanno on November 8, 1943. He was raised on the family farm near LeMars, IA and attended school at LeMars Community and church at St. Catherine’s in Oyens. Larry met Bev Minten in 1966. They married on July 5, 1968, while Larry was home on military leave. Immediately after their wedding, they were stationed with the National Guard in Colorado Springs, CO. After his term of service, Larry and Bev moved to Council Blufffs, IA and then to Atlantic, IA. In 1971, they returned to Oyens, IA to enable Bev and Larry to work together on the Hanno family farm. Bev and Larry resided in Oyens from 1971 to 1989 and then moved to the family farm. Following Bev’s death in March of 2014, Larry developed a special relationship with Denise Denker and the two enjoyed spending time at Okoboji and traveling together. Larry was an avid fisherman, and enjoyed time in nature. A lifelong farmer, he loved the seasons and working the ground. Larry will be deeply missed by his son Eric Hanno of LeMars, IA, and his three children, Bailey, Stormii, and Logan; as well his daughter and son-in-law, Tom & Jen Sandbulte from Sioux Center, IA and their five children, Kendra (Kris Baatz), Matthew, Carter, Caleb and EmmaLee. In addition to his immediate family, Larry’s leaves behind his special friend Denise Denker, and her family Matt & Carie Arens and their three children, Clarissa, Carlie & Cashton and Robert & Tami Kibby and their children Logan, Brianna, Mya, Addie, Aidan, & Annabelle. Larry also leaves behind his in-laws, Darrell & Marilyn Minten of Reno, NV, Sherron & Richard Kriege of Skaitook, OK, Ron & Joanne Minten of Springfield, SD, Barb & Mark Noteboom of Orange City, IA, Marilyn Nunn of Alton, IA, and Dawn & Dave Welch of North Sioux City, SD, as well as several nieces and nephews. Awaiting Larry in heaven are his wife of 45 years, Bev Hanno, a grandson,Taylor Hanno, his parents, Ervin & Regina Hanno, his in-laws Robert & Jackie Minten, and a sister-in-law, Barb Minten. Honorary bearers will be, Bailey Hanno, Stormii Hanno, Logan Hanno, Kendra Sandbulte, Kris Baatz, Matt Sandbulte, Carter Sandbulte, Caleb Sandbulte, Emma Sandbulte, Clarissa Arens, Carlie Arens & Cashton Arens. Casket bearers will be, Randy, Rick, Fred Frericks, Tom Sandbulte, Matt Arens and Robert Kibby. To send flowers or a remembrance gift to the family of Lawrence Ervin Hanno, please visit our Tribute Store. "Email Address" would like to share the life celebration of Lawrence Ervin Hanno. Click on the "link" to go to share a favorite memory or leave a condolence message for the family.